Last week I was invited to preview the Foley + Corinna Fall 2010 Handbag Collection in New York City. I jumped on the opportunity to see what's in store for this luxe handbag brand because, despite the fact that Foley + Corinna is not "budget", I've been a huge fan of their signature Mid-City Tote for years and someday hope to own one of my own. Le sigh. As you'll see from my pics, the Fall 2010 collection takes a dark turn as classic silhouettes are reinterpreted to include details like slashed leather and edgy metal hardware like chains, buckles and studs. The color palette was predominantly black save for a few faux snakeskin prints in beige or silver metallic. If you love seeing their bags in bright colors like magenta, red or camel, snag one in stores like Bloomingdale's or shopbop.com now because these colors will be sparse come fall. Prices range from about $200 to $550. Keep reading to see the complete collection! 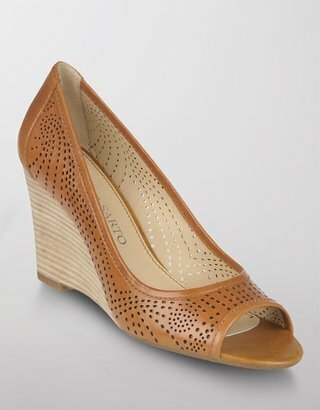 Now on sale for $69.99, these Franco Sarto "Grape" perforated leather wedges are nearly sold out at lordandtaylor.com. A stylish yet comfy shoe that will go great with shorts or skirts this summer. Get the look for less with these Merona Maribel Peep-Toe Wedge Shoes, available in tan, pale blue, lavender or black for $23.99 on sale at target.com. Check out this earlier post to see what the Maribel looks like in real life. Swiss brand Swatch is getting in touch with their roots for their latest collection of 10 plastic watches, each in one solid color, called the Colour Codes Collection. I'll admit I have a soft spot for Swatch—after all, they're the original plastic watch brand, known for their funky designs, affordable prices and reliability, but I haven't owned one in ages. Back in the day I had a Swatch that commemorated the Summer Olympics and another that was hot orange and looked like a parking ticket. Random. Anyways, watches in the Colour Codes collection cost $50 and you can get details here. Do you think Swatch watches are still cool, or making a comeback?